FILE - An Afghan policeman stands guard near burning NATO supply trucks following an attack by militants on a U.S. base in the Torkham area near the Pakistan-Afghanistan border in Jalalabad province east of Kabul, Afghanistan, Sept. 2, 2013. Pakistan again brushed aside U.S. skepticism of its anti-terror efforts Thursday, saying Pakistani security forces are attacking militant groups without distinguishing between "good and bad" terrorists. The statement comes a day after the U.S. Defense Department announced it would not pay Islamabad $300 million in military reimbursements because of insufficient action by Pakistan against the Haqqani network of terrorists and the Afghan Taliban. The funds come from the Pentagon's so-called Coalition Support Fund (CSF) program for allies that incurred costs in supporting the U.S.-led fight against terrorism and extremism. Pakistan has received around $14 billion since 2002, making it one of the largest recipients. Foreign Ministry spokesman Nafees Zakaria, in responding to the decision, told reporters in Islamabad that the CSF "serves shared interests" of both Pakistan and the United States, enabling them to build on the gains achieved over the past years that have improved security in areas near the Afghan border. 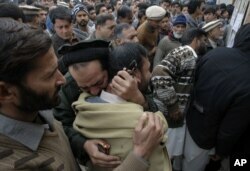 FILE - Pakistanis mourn over the death of their children at an entry gate of the Army Public School, attacked by Taliban militants, as they gather in Peshawar, Pakistan, Dec. 20, 2014. "We have taken decisive action against terrorists and extremists and also cooperate widely with other countries to defeat it. Our sincerity and resolve is unquestionable. … It is our firm resolve that we will take action against any terrorist in Pakistan, whatever color or shape it manifests itself in," he said. Recent tensions in bilateral relations mainly stem from Washington's frustration over Islamabad's alleged unwillingness to act against the Haqqani and Taliban insurgents. U.S. and Afghan military commanders allege leaders and fighters of these groups use sanctuaries on Pakistani soil for plotting and staging attacks against local and foreign troops in Afghanistan. 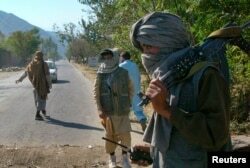 They maintain that while Pakistani counterinsurgency operations are targeting anti-state militants, including the so-called Tehreek-i-Taliban Pakistan or TTP, they have spared insurgents linked to the Haqqani network and the Afghan Taliban and instead covertly support their violent campaign. Zakaria said that over the past decade, Pakistan has concluded a large number of military operations that have "sequentially dismantled and destroyed terrorist infrastructure" on its side of the border with Afghanistan. FILE - Masked Pakistani pro-Taliban militants stand at a check post in Charbagh, a Taliban stronghold, near Mingora, the main town of Pakistan's Swat Valley, Nov. 2, 2007. He said tens of thousands of Pakistanis, including security personnel, have lost their lives in the war against terrorism, in addition to the billions of dollars in losses to the national economy. Zakaria welcomed a decision Wednesday by the U.S. Department of State to designate a TTP splinter faction, Jamaat-ul-Ahrar, as a global terrorist organization. Pakistani officials say the extremist outfit operates out of Afghan border areas and has been behind deadly terrorist attacks on civilians — including religious minorities — and security forces. Bilateral tensions between the United States and Pakistan were exacerbated after a U.S. drone strike in May killed the leader of the Afghan Taliban, Mullah Akhtar Mansoor, on Pakistani soil.